This is a panorama drawing of Messier 33. I couldn't make a field of view that is precisely 1.27° across with any available telescope-eyepiece combination. So I drew the position of the 29 brightest stars into the sketch from the map (Guide). Only the position, that is a tiny dot of the same size for all the 29 stars. Then on the first night I drew all the stars I could see with my 4" Newtonian. After this I used the 16" Newtonian for 6 more nights to draw all the other stars and the galaxy. I mainly used the smallest enlargement with the bigger telescope (71x, 51' field). Therefore I am sure that this drawing doesn't contain all the details one could see using a 16" telescope with greater enlargements (see the detail drawings). 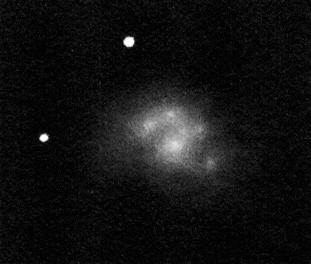 M 33 drawing inverted into positive. M 33 also known as the Triangulum Galaxy was the first galaxy in which I saw spiral arms. It was in 1994 in the summer astro-camp at Ágasvár, Hungary. 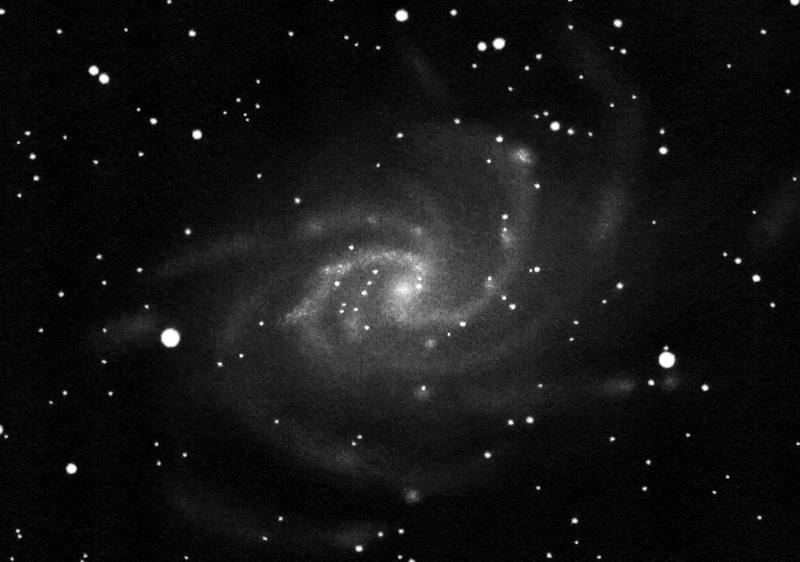 A friend of mine borrowed my tiny 2.5" Newtonian telescope (the "Alcor") and I was shocked to see him draw spiral arms in M 33. It was extremely difficult but as far as I remember I could see the arms as well. Using the 16" telescope the arms are not difficult at all. The spiral arms are full of spots which show details themselves as well. 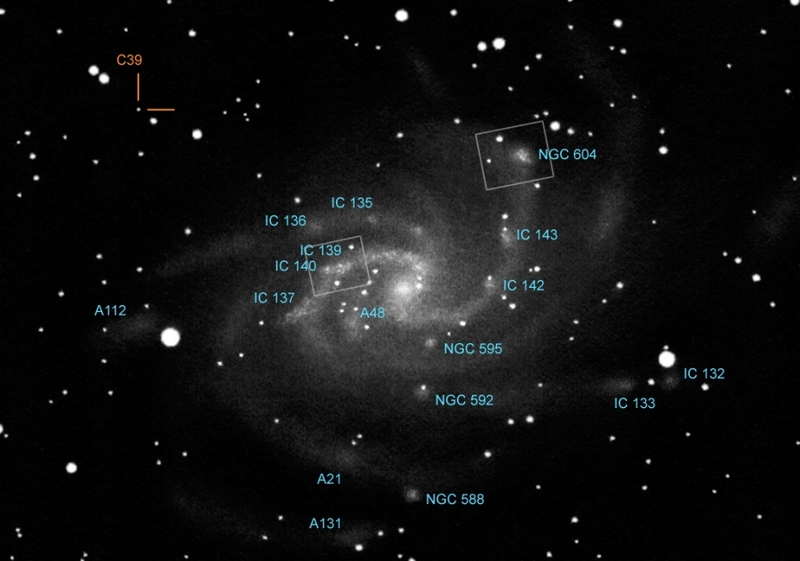 Deep-sky objects in M 33: star forming regions, associations and a globular cluster. The two rectangles indicate the crop of the two detail drawings below. I didn't take a look at the map during the drawing at night - except to find C39. Therefore I am sure I haven't seen all the bright spots that could have been seen. 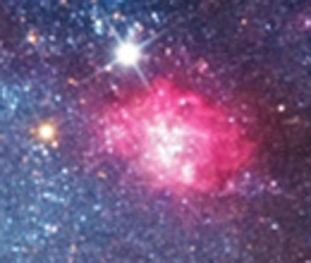 C39 mentioned above is the largest and brightest globular cluster of the Triangulum Galaxy. 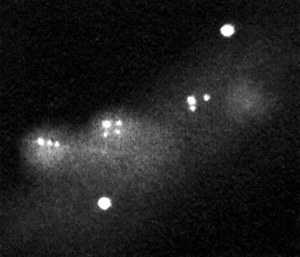 I could spot it only using 220x enlargement as a very faint stellar object. You can see a photo of M 33 above courtesy of Iván Éder. It was made using his 12" astrograph. I cropped my inverted drawing to show a similar area of the sky as the photo. 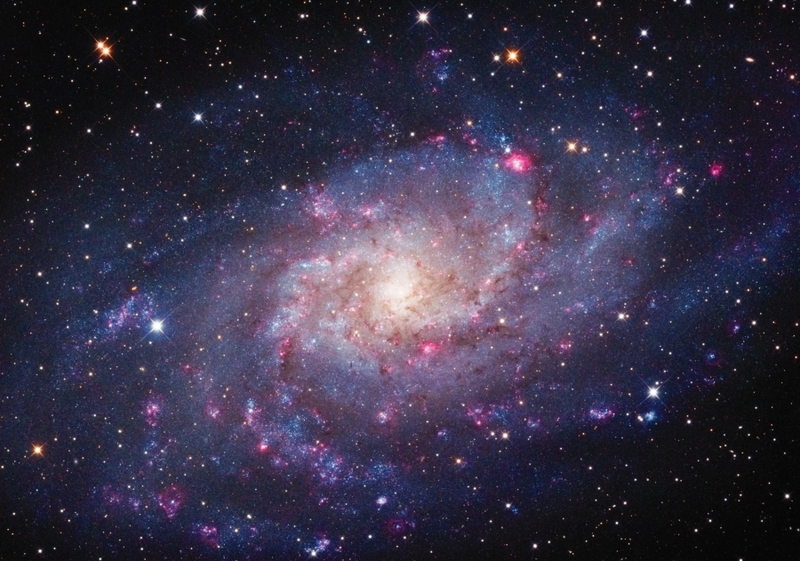 M 33 contains countless bright patches in its arms. 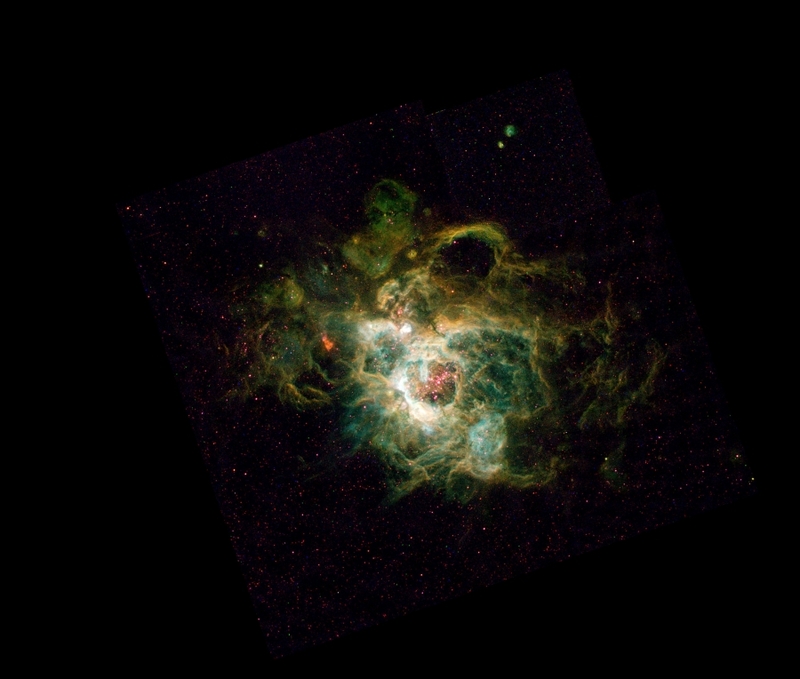 The brightest is the star forming region NGC 604. It is the biggest star factory in the whole Local Cluster. 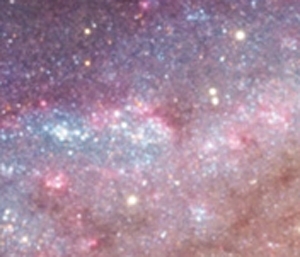 Although the Tarantula Nebula in the Large Magellanic Cloud is brighter and more concentrated. Due to its distance of 2.7 million light years NGC 604 seems to be really tiny in the eyepiece of the telescope. Nevertheless it shows a lot of details. 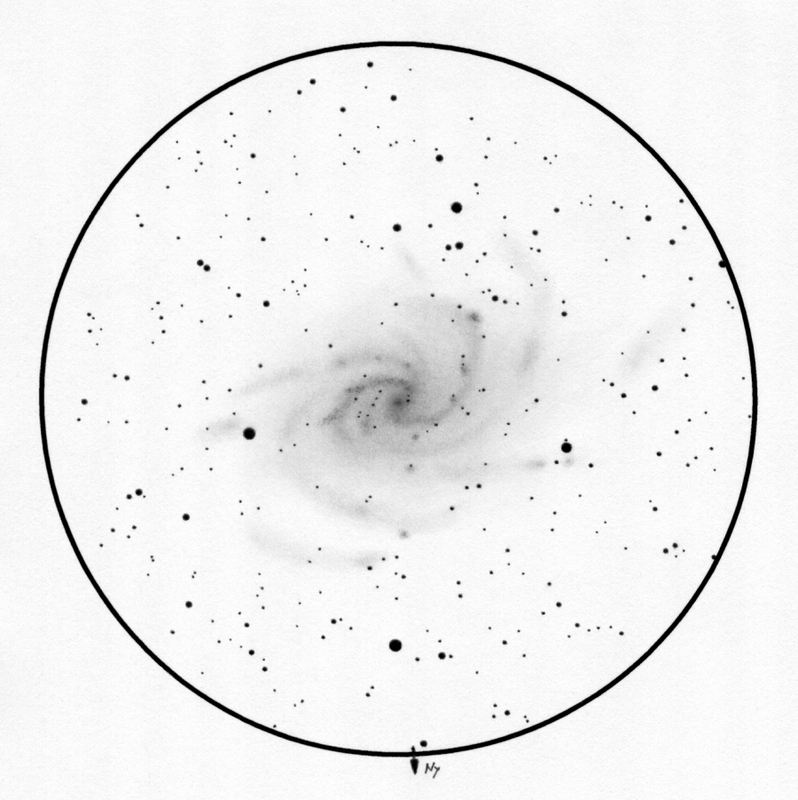 But neither individual stars nor star clusters can be seen in it using the 16" telescope. I drew another small area: the milky-way patches IC 139 and IC 140 in the other main arm of M 33. You can see young open clusters and diffuse nebulae in these patches in the photos. I spotted a few stellar spots in them - these are not stars but rather young and dense open clusters. The stars outside the patches are foreground stars of our own Milky-Way.